First it's important to note that there are two types of cog switch as shown in the picture below. Both of these should only be placed on a ledge. 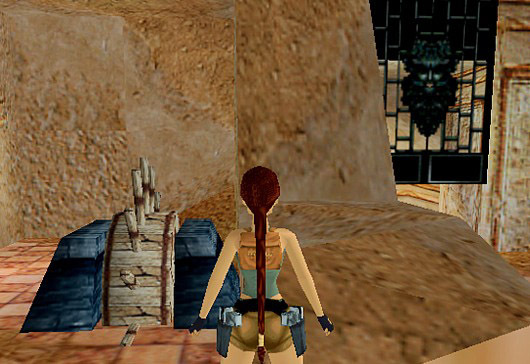 If placed on the floor it normally results in the level crashing when Lara operates it. The switch on the right is found in the Chambers of Tulen wad (Cortyard.TR4) and can be used on either the floor or a ledge. Both types of switch can be used with any door regardless of the doors animations except trapdoors and the rolling door from Angkor Wat, as the door rising/falling animation is hard coded. 1. Lara will only operate the switch from one end. 2. The door requires an ocb code of 1. 3. The door will only raise to a height of one click above its own height regardless of the ceiling height above the door. 4. The time taken for the door to close is dependent on the height of the door itself, taller doors will close more slowly. This picture shows the Guardian wad switch in use on a ledge and also shows the position of the triggers underneath the switch. These triggers consist of a switch trigger for the Cog Switch and a standard trigger for the door object. Finally this picture shows the Chambers of Tulen Cog Switch being used with a door from the Coastal Ruins wad. A special thank you to Fluen for providing me with new information concerning these switches.